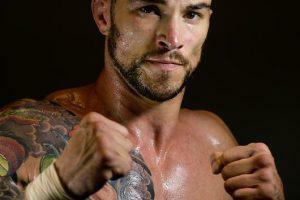 At age 5, Brandon Thatch had a life-altering moment that brought him to where he is today in the sport of mixed martial arts. He was adopted by Clarence Thatch, a seven-time Sabaki champion and ISK heavyweight contender, that his mother began dating when Brandon was just a child training in Clarence’s karate class. Eleven years later, Brandon became enamored with the sport, and one year later at age 17 – he fought in his first official kickboxing match. Brandon is now 29 years old, and it comes as no surprise that he’s one of the fastest rising prospects in MMA, amassing a 11-13 record as a professional. All of his wins have come by way of stoppage inside the first round, eight by knockout and three by submission. Thatch’s brutal brand of Muay Thai striking is his primary means of finishing off his opposition. With a 6’2″ frame, Thatch can work from range and in the clinch with ease, but he’s far more destructive in close quarters, shoving opponents’ faces into his knees and following up with strikes. On the ground, Thatch is an excellent grappler who has the know-how to smother opponents. Aside from the obvious advantage due to his long frame, he’s adept at maintaining control from the top and accurately punching opponents out. Thatch is currently competing in the welterweight division of the UFC.